Review: Cassius Issue 2: More diversity, more plot thickening! I’ve previously written about Cassius Issue 1 for GeekGirlCon, and now I’ve been given the opportunity to continue following Junia in her epic adventures to understand the mark of Cassius! 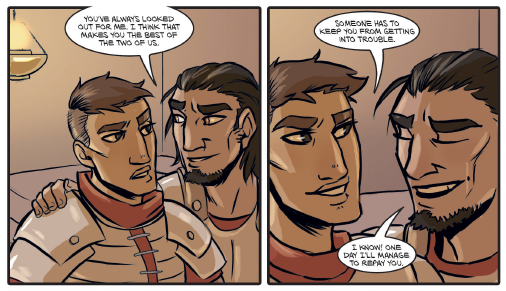 As a bit of a recap, Cassius is a story from Arbitrary Muse Comics, the collective mind of Ann Uland and Emily Willis, and, while inspired by the Shakespearean play Julius Caesar, it’s clear almost right away that this is probably not the sort of story that Shakespeare imagined. Junia, the protagonist, inherits the mysterious mark of Cassius from her mentor—while on the run from would-be assassins—has to discover the meaning of the mark and what her destiny is. It sounds like a typical hero’s journey story, but when the protagonist is a lesbian woman of color, think again! Not surprisingly, my favorite part is the diversity of characters that abounds within the comic’s digital pages. It’s very, very long overdue and so refreshing to see people of color, LGBTIQ* individuals and people of varying abilities and size, without having the narrative call attention to this fact. It’s wonderful just to see so much representation just being there and normalized as part of the story. In this issue, we’re also introduced to other new characters, including Albia, a genderqueer soldier who was tasked with the assassination of Caius in Issue 1—and which, inadvertently, sets Junia off on her quest. Although they are only in the story for a single scene, I found Albia to be a fascinating character. In the dialog that they have with Antony, it’s clear that Albia is fierce, strong-willed and also driven by a mysterious message that we’re not really getting the full idea of yet. I really want to see their character development—and I get the impression that things will get interesting when they and Junia meet again! Arbitrary Muse also brought new artist Cat Batka on board for this issue. The changes are subtle though in the artwork, but they’re there: while the characters look similar in this issue to the previous one, the coloring seems a bit softer and nuanced, and the lines are more detailed. Overall, I didn’t feel like this issue was really as much about Junia as it was about the mark of Cassius and the secret cabals and conspiracies around the mark. That may be okay though; the world of Caesarian Rome is complex and perhaps more setup and establishment needs to be done before the story gains more momentum. Because there are a host of new characters and locations, and given the fact that it’s a few months between releases, I found it a bit hard to follow Issue 2 without rereading Issue 1 to reacquaint myself with the world and characters. Having all caught up though, I finished reading the issue wanting to know more about what’s going to happen next! Cassius Issue 2 is now available for $2.99 on digital download. You can also get Issue 1 here. This post was originally published for GeekGirlCon’s Blog. Categories: Comics, Published work, Reviews | Tags: Arbitrary Muse Comics, Cassius, Comics, LGBTIQ, Shakespeare | Permalink.